I am killing two birds with one stone so to speak today. I have been very fortunate to have a lot of time this week to create art. These two birds are one of my favourites The Tui. It was scarce for a number of years but now is becoming more common as it is moving into the towns and cities as people are planting more native trees and shrubs in their gardens. It has a beautiful song and a couple wake me up every morning singing to each other. They are a largish bird and rather clumsy, but oh how they sing and their iridescent colours just gleam in the sunlight. The male has a beautiful white ruffle of feathers under its beak and white thin feathers behind its head. The Tui is a nectar eater and unfortunately gets very greedy in spring when the Kowhai Tree is in flower. They can denude the tree overnight and leave a carpet of shredded flowers for us humans to sigh over! Sometimes it seems as they are having a drunken brawl over the flowers and is rather funny to watch. 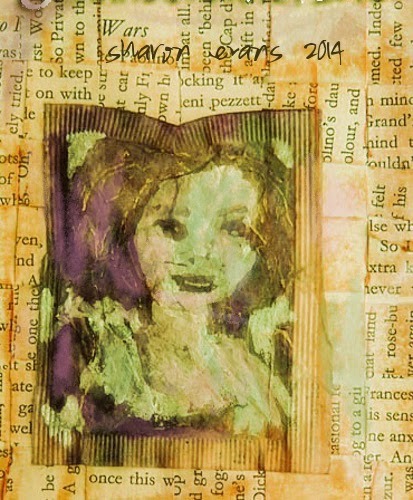 The theme for art Journal Journey this month is collage. I decided to get out my plastic box full of abandoned projects and make some art from them. Some time ago early last year I had a period of painting portraits on teabags. The page above I pasted onto a small page of weaved strips from pages of a book that I am altering. Then I just simply washed some watercolour over the lot. The page below I pasted the teabag onto some ripped squares from the same book and then pasted that lot over half of a spoiled watercolour of anemones. Then did a bit of splashing! Moral of story don’t throw anything out, it can be combined with other bits and pieces to make an okay page. Um I still have lots of teabags and scraps and messed up paintings to use up, so no doubt I will be posting more collages before the month is out. and Susi and Valerie for hosting Art Journal Journey. Visit both as there is some wonderful art to be seen. Amazing artwork this all dear Sharon! 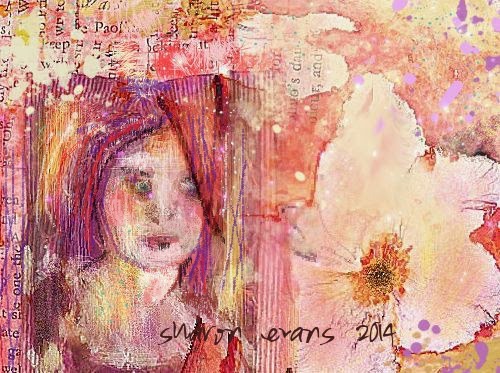 So glad you are with us again this month over at Art Journal Journey! Sharon I just love your watercolor birds... there beautiful, and the art journals are so much fun!!! wow love your theabag faces! Beautiful work on the Tui and lovely collages! You have been productive. love your teabag collages and the birds are painted so wonderfully! 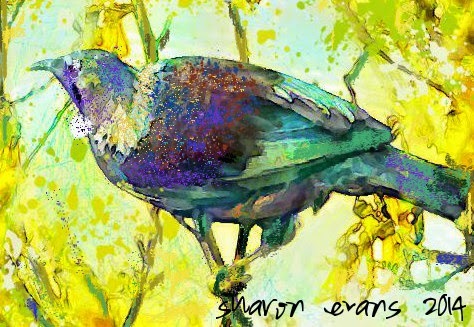 Hi Sharon..wow..I am awestruck by your gorgeous birds..I have fallen in love with them..I love your painterly style and expressive colors and brushwork...they are absolutely stellar and magical...pure beauty! very inspiring! Sharon your birds are so vibrant and lively. You have a real talent for capturing wildlife in paint. Happy PPF! Gorgeous and I love your birdies they are stunning! I love all your work as usual, but I'm especially fond of your birds today. They are gorgeous. Happy Holidays! Beautiful birds and I especially like the one with the white feathers under his beak. Great effects on your pages as well. Very nice work! 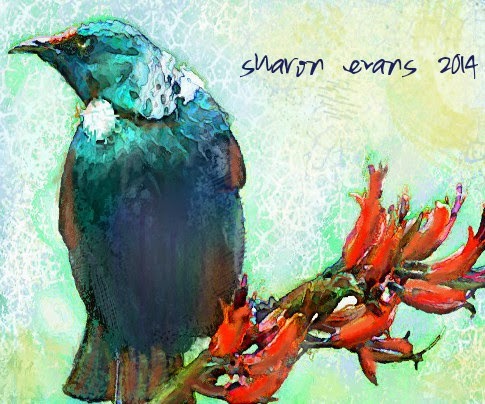 Beautiful portraits of the Tui birds. I love bird watching and they look like they'd keep me entertained as well. ooohh wow,love your collages so much,very wonderful. Your birds are so lovely! I love them so much!! Absolutely adore your painted birds, this bird sounds wonderful with its gleaming colours and lovely song. Your collages are just amazing, what wonderful surfaces. I love the first with the woven printed paper and painted on a teabag!! and the second with the way you have made it such a success with an older painting. I am lost in admiration at the way you can use colour. Beautiful birds and painting on teabags = so wonderful!